The illustration, which seems to be in pencil, captures the look and essence of everything I love about Pride and Prejudice perfectly. The stiff upper lip that is just overshone by an arched eyebrow from Lizzy suggesting that all is not what it seems. The Sara Hingle illustration just immediately caught my eye. She regularly illustrates Frankie and I would know her depictions anywhere, but this one I warm to more than any. It feels so familiar. 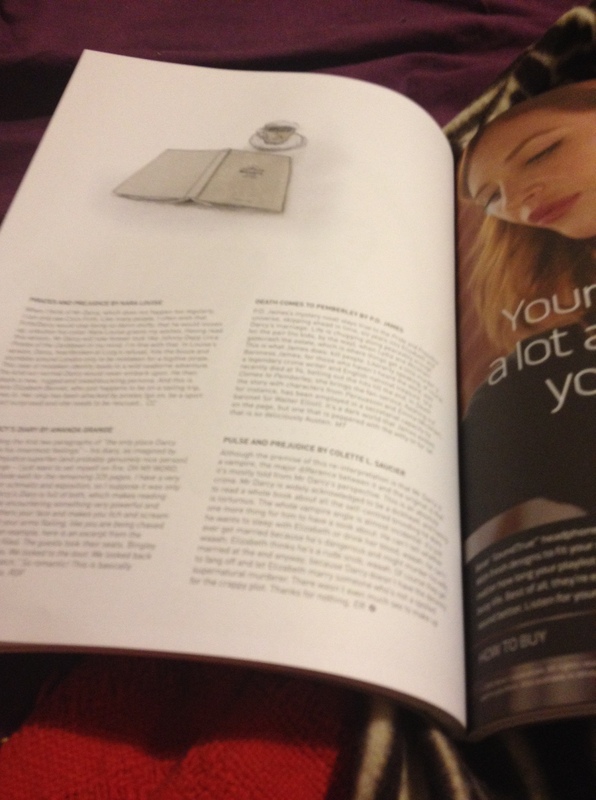 Turning the page is the ever more comforting drawing of a cup of tea and a book. Perfect. 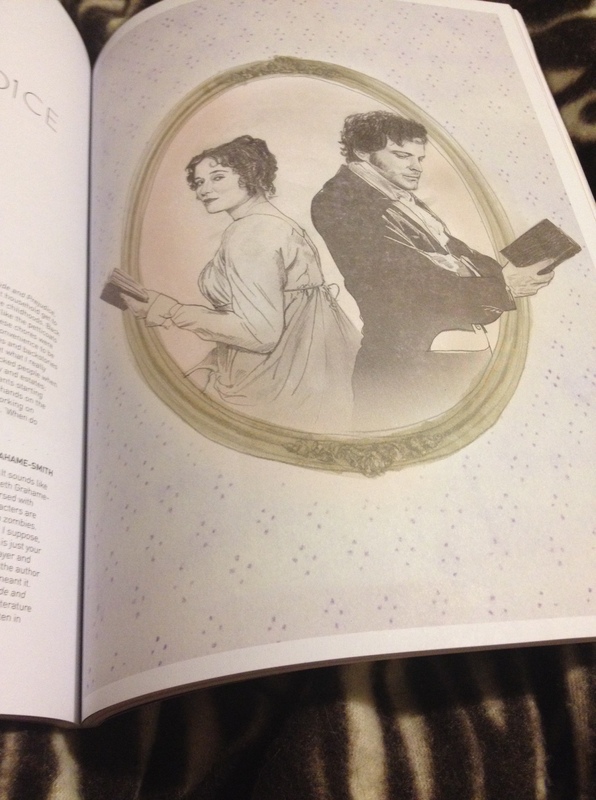 Despite Hingle’s somewhat whimsical style, Elizabeth Bennet still leaps off the page – I can just feel her thinking. 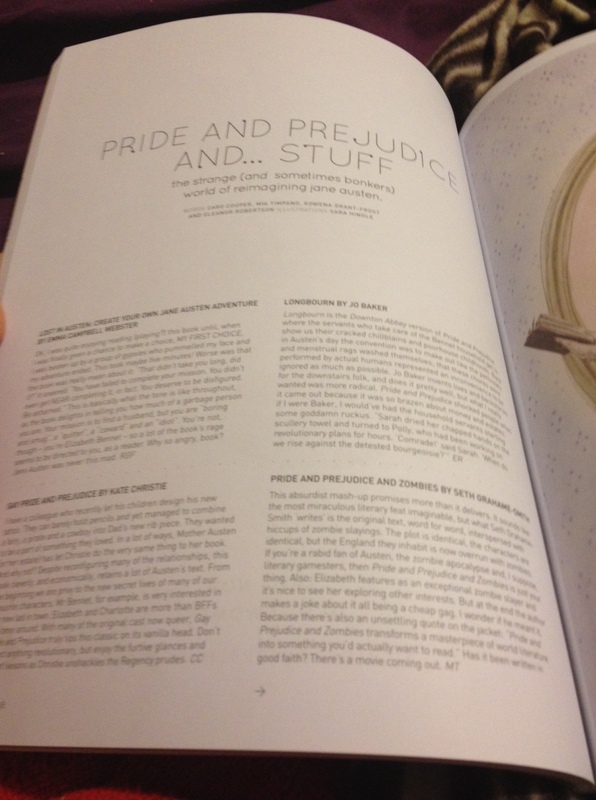 The article reviews eight different Pride and Prejudice spin-offs, written by Caro Cooper, Mia Timpano, Rowena Grant-Frost and Eleanor Robertson. I’ve read most, but not all of the books that they discuss. I have not yet read the other two they mentioned – Pirates and Prejudice by Kara Louise and Pulse and Prejudice by Collete L. Saucier (which is one of the many Pride and Prej vampire spin offs). What I love about the article is, firstly, the very true subheading: “the strange (and sometimes bonkers) world of reimagining Jane Austen”. It is bonkers out here, and we love it. Inflicted by Jane Austen madness as we are, the crazier and often cruder the stories get, the better. Whether it’s Fifty Shades of Mister Darcy, Pride/Prejudice or even Fitzwilliam Darcy Rockstar, most of us can’t get enough, loving the good ones and loving to hate the bad ones. But do the reviews make me want to read the two I haven’t yet touched? Um, kind of. Pride and Prejudice mashed with Pirates of the Carribbean isn’t necessarily my kind of deal, but I do adore pirates when they don’t involve Orlando Bloom and Keira Knightley (Johnny Depp can stay). There’s something about a drunk Darcy being mistaken for a pirate (what?!) and Elizabeth needing rescuing. So basically, same characters dumped into a new scenario. I’m sort of up for that. Meanwhile, Pulse and Prejudice in the dreaded vampire P&P genre already has me wary. Robertson warns: “Mr Darcy is widely acknowledged to be a dickhead, and having to read a whole book about all the self-centred brooding he does is torturous.” But hey, I did stick it out through Mr Darcy, Vampyre (surely it can’t get much more droll than certain scenes in that book). I’ve determined to put them both firmly onto my reading list – even if I end up mainly amused and perhaps prompting a migraine. I may even share the reviews with you here and see just how they match up to the short Frankie spiels.